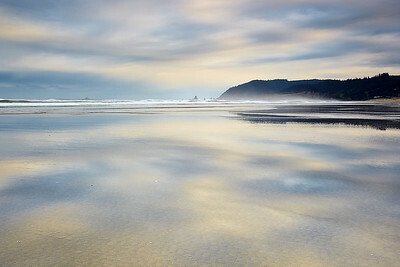 The Oregon Coast is dramatic, with beaches that range from small coves to endless stretches of perfect sand. The images below are just the first of many that I will capture in the future. 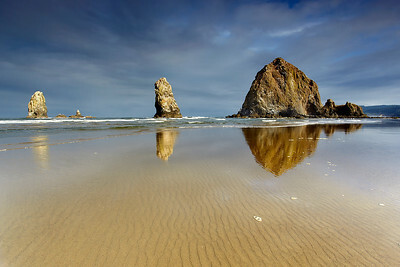 Canon Beach in Northern Oregon is an exceptionally wide, long and flat beach with a number of large rock islands and sea stacks offshore. Low tide is often the best time to see it because you can get closer to the rocks and the sand is glossy and smooth both for walking and for photography. On this morning, a small hole opened up in the clouds deck and for two short minutes, the sun illuminated this scene against a dark sky. I had already moved into a good position with the ripples pointing towards the middle stack. After that, I hoped for some nice light! This is a view that include only one of the needles, so that you can get a closer view of Haystack Rock. The light was too good to resist for about two minutes, so I captured several variations of this scene. 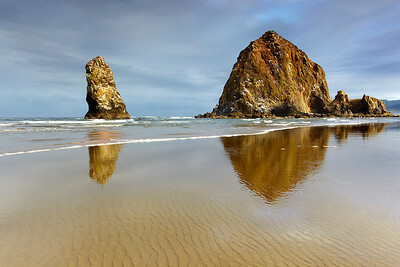 These are the needles that stand to the left of Haystack Rock on Cannon Beach in Northern Oregon. They are actually quite large, as you can see by the very small dots that represent the nesting birds. I made sure to get some good light and reflections into the frame before making this exposure. 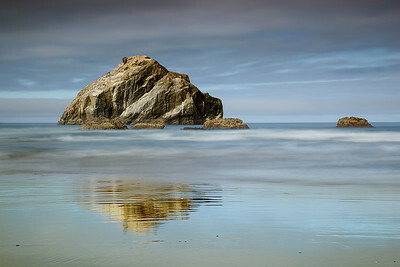 Face Rock is the famous icon of Bandon State Beach in Souther Oregon. It sits amongst many wildly shaped sea stacks on an outstanding wide sandy beach. To capture this scene, I waited for the sun to glance across the face at a slight angle at about 10am. Usually this is not a great time of day for dramatic light on the landscape but with dark clouds behind, a hole opened in the clouds and illuminted the rock and beach for just a few minutes. The sun rose to the left of the frame and lit up the clouds during a low tide. This allowed the ripples of the last flows of water to be highlighted and the wide expanse of the beach to be felt. This is an excellent walking beach at low tide! 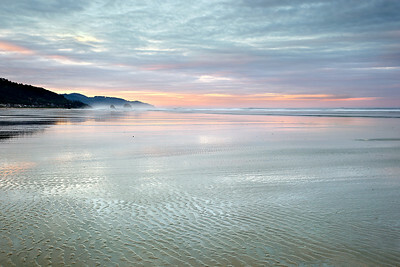 This is the view looking north from Cannon Beach towards Ecola State Park in Oregon. Low tied is the best time to capture a scene like this. In the full sized version, you can easily see the little Tillamook Lighthouse. 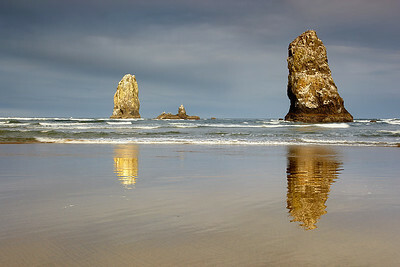 There is no way you can witness a low tide at Cannon Beach and not be drawn into the almost infinite and reflected view. 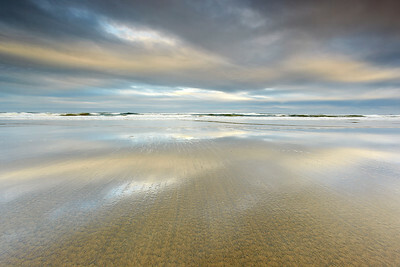 So I chose a spot with the best reflections and sand patterns to draw the eye towards infinity. Then I waited for some light from an opening in the clouds and some waves to make a solid horizon.